WHY SPEND DAYS WRITING YOUR OWN? 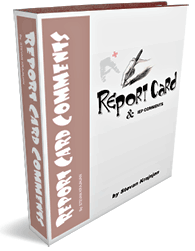 REPORT CARD COMMENTS e-book is a huge, 180 page, collection of teacher comments that can be instantly downloaded and read on any computer! All 1830 teacher comments/remarks have been ranked and organized by: subject, most positive to most negative; shortest to longest; and general to most specific and marked accordingly. Browse and locate comments on your computer screen quickly and easily, as key words are bolded and pages uncluttered, bright – (see sample pages below). All comments are printable and ‘copy and paste’ enabled. 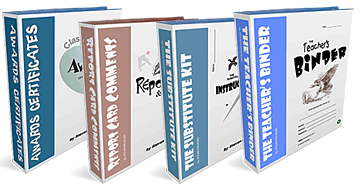 Use for ANY reporting period, even end of year!